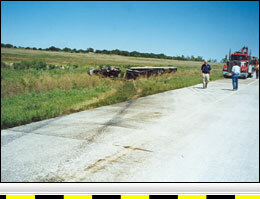 Documentation and analysis of physical roadway evidence, including Forensic Mapping. Documentation and analysis of physical vehicle damage evidence including Forensic Mapping of vehicle damage profiles. Downloading of automobile and truck event data recorders. ·	Mathematical reconstruction of vehicle speed and positions before, at, and after impact. Below is a detailed explanation of crash reconstruction to allow you to better understand what it is. Link to our reconstruction experts. 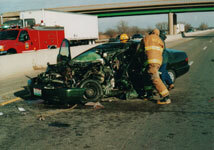 Crash reconstruction, as a process commonly applied to motor-vehicle collisions, determines pre-impact circumstances from physical evidence at the crash scene. It is most dependent on the physical equations developed by Sir Isaac Newton, most commonly referred to as Newtonian Physics. For purposes of analysis here, the mathematical relationship between energy dissipation and work, the principle of Conservation of Energy, and the principle of Conservation of Linear Momentum will all be applied. Crash reconstruction, however is also as much art as it is science. The art is knowing which equations apply to each crash, knowing what input assumptions are reasonable, knowing what factors constrain a solution (such as one vehicle cannot physically pass through another), and knowing when independent methods can be applied to validate a solution. A commonly held misconception is that a crash reconstruction is inclusive of all elements of crash cause analysis. Also, it is commonly assumed that anyone who claims to be a reconstructionist is capable of analyzing all the causative elements of a crash. In reality, a reconstruction is only one element of cause analysis. A reconstruction is essentially the application of physics to a collision scenario in order to determine things like vehicle speeds and impact angles. To assume that a person who holds himself out solely as a crash reconstruction expert will be capable of analyzing causative factors such as mechanical failure analysis, brake factors, roadway factors, driver factors, etc. is a mistake. 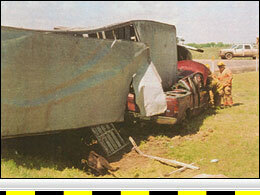 These as well as other factors can play a roll in the reconstruction of an crash. However, they are a separate part of cause analysis. If a person is investigating the causative relationship of these other factors, he must have related knowledge, experience, training, and education. 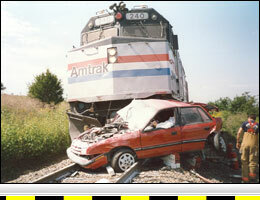 A crash investigation can consist of many aspects. However, the investigation usually starts with an inspection of the crash site, where measurements are taken of evidence left by the vehicles such as point of impact, final resting positions, skid marks, scrub marks, and gouge marks. These measurements are usually taken using electronic surveying equipment. With this equipment, a computer-generated scale diagram can be produced and may be used to reconstruct the crash. Vehicle inspections are another typical part of the crash investigation. These inspections will usually include measuring the amount of damage and the damage profile of the vehicles. This information is useful when an crash reconstruction is performed. The mechanical components of the vehicles such as brakes, steering, tires, suspension, lights, etc. may also be inspected and tested by a qualified person to determine if the condition of these components was a causative factor in the crash. 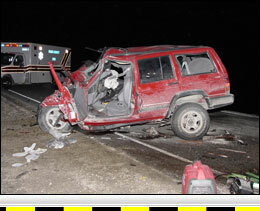 With the crash investigation complete, a crash reconstruction can be performed. Reconstruction is the process of using physics to determine the speeds of the vehicles, and/or their relative positions at different times during the crash sequence. Information such as the pre- and post-impact direction of travel, the length of pre-impact skid marks, the post-impact distances moved, the friction values for the various surfaces the vehicles traveled over, the point of impact, the impact angles, and the weights of the vehicles are all inputs to the equations used in reconstructing an crash. 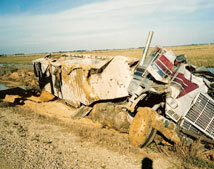 There are many types of crash scenarios such as head-on, rear-end, right-angle, oblique, or roll-over. Each of these different scenarios requires a different method to reconstruct. However, generally speaking, a crash reconstruction will determine how much of a vehicle's speed is lost in each part of a collision sequence. Take, for example, a vehicle that skids off the road and strikes a tree. 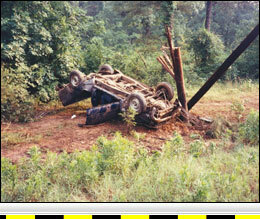 A reconstruction of this crash uses the vehicle's damage profile to calculate the speed at which the vehicle struck the tree and then combines that speed loss with any speed loss due to the vehicle skidding prior to impact in order to determine the pre-braking speed of the vehicle. 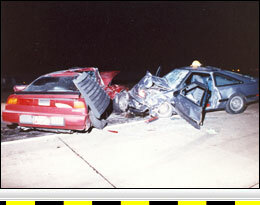 A slightly more complex crash reconstruction involves two vehicles first skidding, then colliding with each other, then sliding to a stop. For this type of crash the method used is called the Conservation of Linear Momentum, which takes into account the weights of the vehicles, the point of impact, the angles at which they collided, and the places where they came to rest. To be more specific, take the example of two-vehicle collision where one vehicle is traveling due south the other vehicle is traveling due west. After these two vehicles collide, the rules of physics tell us they will move generally southwest, with all of the southward momentum resulting from the southbound vehicle and all of the westward momentum resulting from the westbound vehicle. If the reconstructionist knows how much each vehicle weighs, how far each vehicle moved south, how far each vehicle moved west, and what coefficients of friction were encountered, then he can calculate a collision speed for each of the vehicles. This collision speed for each vehicle can then be combined with its speed loss from pre-collision skidding to calculate its pre-braking speed. Continuing with this right-angle crash reconstruction, the pre-braking speeds can be used to both look at time-distance relationships before collision and to pose "what-if" questions. For example, if one of the vehicles was found to be speeding before collision, the reconstructionist could pose the question of what would have happened had that vehicle not been speeding. By moving that vehicle at its calculated speed back from the initial braking point by say 1.5 seconds, for a normal driver perception-reaction time, the reconstructionist can determine a point of perception. Then by asking what if that driver had been traveling at the speed limit, had taken 1.5 seconds to perceive and react, and had locked the brakes, the reconstructionist can determine if the crash could have been avoided if the driver had simply obeyed the speed limit. In many cases, the reconstructionist is faced with the situation where he does not have complete information. This could be due to a poor evidence record or the result of other factors that cannot be accounted for. With incomplete evidence, the reconstructionist may make educated assumptions to account for the missing evidence. This is acceptable practice so long as the reconstructionist makes assumptions that are conservative to his client's position. Since assumptions can exhibit a bias in calculations, the expert's method should be designed so that the bias does not favor his client but instead will favor the client's opponent. This is what being conservative means. For example, if an assumption is made by a reconstructionist, for that assumption to be conservative it must produce higher speeds from his client's vehicle and/or lower speeds for the other vehicle. In some cases, when complete information does not exist, a Conservation of Energy analysis can be used to validate the calculated collision speeds. By using the same data and/or assumption employed in the Conservation of Linear Momentum Analysis, the Conservation of Energy method can be used to check if the same collision and/or pre-braking speeds can be reproduced. If not, sequential validation can used by varying the assumptions until a reasonable balance is achieved giving the best estimates of those speeds.